Today's blog has been partially pre-recorded. There are two reasons for this. One it's my birthday and I'm hoping that the husband is going to take me somewhere lovely and special (although judging by the pouring rain hammering on the Velux window as I write this first part, I have a feeling we're going to be stuck home all day). And two, the recipe I'm trying takes two days to make. Yep. Two days. But was it worth the effort? As I've mentioned before, this blog was inspired by my lovely cousin Laura, @BridestockBride. She tweeted me during GBBO and asked if I'd ever made my own Danish pastries. The answer was no. But I'd love to give it a go. So today and tomorrow (or yesterday and today, or the 20th and 21st December 2011 depending on when you're reading this) I'm trying out Joanne Wheatley of GBBO fame's Danish pastry recipe. Now there's no two ways about this. Proper Danish pastry or French croissant dough is a faff. Like puff pastry, there's lots of rolling and folding and resting and rolling and folding and resting. This recipe requires four lots of the above at hour-intervals. So not something I'll be doing every day. Or probably again any time soon. Unless there's a particularly special occasion, I'll just pass if it's all the same. It's too labour intensive for a full time working mother of a toddler who struggles to deal with the constantly full laundry basket (I struggle to deal with the laundry basket and the toddler - I'm not using her for slave labour just yet). So the idea that I might have time for the frivolity of making my own Danish on a regular basis is just a pipe dream. And if I won enough money on the lottery to give up work, I'd just move to France where someone else could make said patisserie for me. Back to my birthday. I'm not high maintenance. Far from it. In fact, most of the guys I know wish they could have a spouse/girlfriend who is as undemanding as I am (my husband would not agree with the preceding statement in public). Take yesterday's lunchtime conversation. I am the only woman in a team of 20. Topic for the day 'What are you buying your other half for Christmas?' After listening to endless tales of the luxuries required by my colleagues wives, I was asked what I wanted for Christmas. "Oh nothing" came my reply. When pushed "well I'm hoping to get a sugar thermometer. I'd like some time to myself to go running. I'd like to not have to cook three separate meals every evening." No shoes, no handbags, no perfume or expensive trips to New York. If they were offered, of course I wouldn't say no. But I'm not one to ask for them. When we lived in London, one birthday we had a private flight on the London Eye and Tea at the Ritz. I didn't ask for it. I never would. I loved the surprise. If it was offered again, I'd love it just as much. But to me, the perfect day would be breakfast in bed and then a trip out with my little family with no tantrums (from either the toddler or the husband). Every year, the husband asks what I want to do on my birthday. Every year it's the same reply. Breakfast in bed - croissants or pain au chocolat, fresh juice and coffee. Every year he nips off to Sainsburys at 9pm only to find that they've not restocked the shelves yet and returns empty-handed. I wouldn't even consider suggesting buying bake your own croissants from a can that you can sometimes get in the chilled section of the supermarket. And with Greggs being the only bakers in town, nearly-French patisserie isn't really an option. So this year, I decided to have a go at making my own pastry. With a day off work and Miss A at nursery (another wish - not to be judged by my friends who are lucky enough to have family who take their kids off their hands for sending Miss A to nursery once in a while when I have a day off so I can catch up on housework) I had some time in between cleaning ready for Christmas to give this recipe a whirl. I found the pastry really difficult to work with. I'm rubbish at rolling pastry out evenly at the best of times (I can turn a shop bought, perfectly oblong block of pastry into a weirdly shaped polygon in no time) but this pastry was a whole other level of strange to work with. It was like trying to roll bread dough out. Except the lumps of butter made it hard to even attempt to roll evenly and every time I rolled it one way, it just contracted itself back to half the size. Then when I put it in the fridge - a step that is supposed to slow the yeast growth - it just took on a life of its own and multiplied its width three times. I'm was thinking that maybe my fridge was too cold as the butter seemed so solid and I would have expected it to need a slightly warmer butter consistency as it didn't spread evenly through the pastry - it just hung around in nasty lumps. But then if I'd left the dough in a warmer climate, it may well have turned into a behemoth given its propensity to grow in my cold fridge. Anyhow, it's now resting overnight so that I can bake my own pastries first thing in the morning. What's the betting that tomorrow, the husband will proudly present me with some croissants he procured at Sainsburys last weekend? Well this is definitely one recipe I'm going to need to work on. I think I need a better understanding of the science behind the bake before I attempt it again. I'm not sure quite what went wrong because despite worrying my pastry had lumpy butter, it looked a lot like Jo's pictures in her blog, but when baked it didn't work. 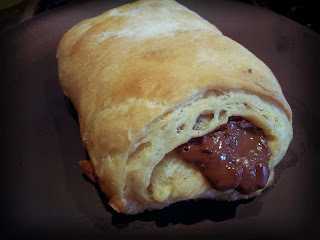 I hopped out of bed this morning and made four pain au chocolat for the husband to bake. Instructing him to cook them for twenty-five minutes, he did so to the second and they were singed beyond recognition. Just can't get to grips with my oven. Some bakes take ages and on this ocassion, they obviously needed a lot less time. Just baked one now whilst putting together some goodies for F-I-L's christmas hamper (more on that tomorrow) and it took 30 minutes to cook, it was dripping in butter and the result tasted very buttery but had a bready texture, rather than the crisply-soft pastry that a true French pain au chocolat would have. All my mistakes, I'm sure - especially as these helped Jo to win the Great British Bake Off in 2011!